Within its latest work, ERP considers storage as a system-wide service for the storage of energy in multiple forms. 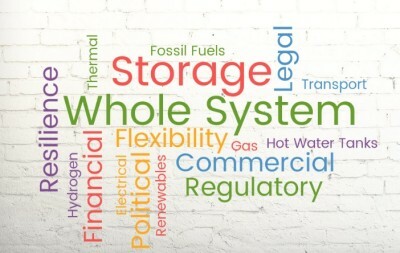 The financial, legal, political, commercial and regulatory barriers to electrical, thermal, gas, hydrogen and transport storage are addressed. ERP’s work in 2011 highlighted that Energy Storage is not a panacea – there are other competing options (e.g. Interconnection or Demand-Side Response). Under the right conditions however -where the system shows a clear need, or a market-pull – Energy Storage has the potential to provide multiple benefits to the energy system. ERP notes that Energy Storage capabilities are already at the heart of our energy system – in the form of fossil fuels which currently provide large volumes of long duration storage over a period of months. Economic as well technical solutions are therefore already in existence. However, new challenges are being created by changes to our current system e.g. renewable technologies, electrification of heat and transport, the phasing out of coal, discussions over the future role of gas, and alternative options using Hydrogen (e.g. for power-to-gas, storage and transport). A key challenge is therefore to replace the current high value, low cost solutions that are already offered and provide storage that accounts for daily fluctuations, as well as variations over several weeks and months or seasons, in a cost and benefit-appropriate way. It has long been recognised that more modern Energy Storage applications have a role to play in the future success and management of energy systems. This is particularly the case with pledges from a number of countries internationally (e.g. at the recent COP21 talks in Paris, December 2015) to limit the rise of global warming; resulting in commitments to further increase penetrations of renewables within the global energy mix. Alongside this increase in renewables, Energy Storage is deemed a valuable and complementary solution for storing electricity that is generated variably and intermittently, dispatching it as needed to meet demand. The use of Energy Storage alongside renewables is not the only area where storage can potentially add value though. Energy Storage provides a complex field for analysis, with an array of possible technologies and applications, with many locational and temporal considerations. These wide-ranging applications provide storage with the potential to compete in a variety of energy markets, plus markets for energy services. ERP’s work on Energy Storage (2016) will provide a system-wide overview of the current financial, legal, political, commercial and regulatory challenges for Energy Storage deployment to 2030 with a “light-touch” focus on the technical challenges. Help catalyse & mobilise an ES supply chain of value to the UK, stimulating investment. This last aim will be achieved by enabling collaboration of the parties and actors that are key to the system-wide development and deployment of Energy Storage. In relation to step 1, an ‘inputs and scoping’ workshop was held in April 2016 to facilitate discussion amongst attendees and representatives from across the energy system, and to gather first-hand knowledge and experience of the barriers faced. In addition to interviews with relevant contacts from the wider energy community, the workshop has helped to inform ERP’s project work and the examples or case studies referred to. Following the above analysis, ERP’s project will highlight significant barriers identified and put forward recommendations for how energy storage applications can be enabled and utilised across the UK. Peter Bance, Origami Energy Ltd.
Nick Heywood, Origami Energy Ltd.
For more information about the project, please contact ERP .